Legate Fasendil, an Altmer soldier, is the Imperial Legion officer in charge of operations in the Rift. His initial camp is located due south of Ivarstead, and he can later be found in Mistveil Keep in Riften should the Legion claim the Rift. 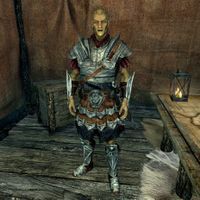 Fasendil wears Imperial armor with matching boots and bracers. He wields an Imperial sword and a steel dagger and carries an Imperial bow for long-distance attacks. He carries a number of steel arrows and his sleep outfit, a belted tunic. Fasendil was the son of traveling merchants who settled in Cyrodiil. Wondering if he "inherited their wanderlust", Fasendil joined the Legion to see the world. While stationed in Hammerfell in 4E 42, Fasendil, while on leave, went searching for relatives among the Altmer refugees in Sentinel (who had fled from the Thalmor in Alinor). While making his way there he witnessed the sky light up as the Thalmor attacked Altmer dissidents living in the city, which resulted in the destruction of the refugee district and the murder of many refugees; the incident gained infamy as the "Night of Green Fire". Fasendil requested a position in Skyrim in order to keep an eye on the Thalmor, whom he suspected of having a role in fueling the civil war. "You're from Cyrodiil? What's it like back home?" "Home? Home to me is a hot cup of ale at the end of the day and five minutes without someone needing something from me... Cyrodiil is a beautiful place, full of diverse peoples and histories. But so too, Hammerfell and Skyrim, and every other place I've been. Don't get me wrong, every country has its dark corners. But that's why we're here. To bring order and civilization, and to protect the people." "Not everyone seems to want us here." "Ulfric and his thugs are stirring up trouble for their own agenda. The Empire is the only thing keeping the Dominion from walking all over Skyrim. It matters little if some of the people here are ignorant to that truth. They are still citizens of the Empire. It's our solemn duty to protect them." "Sounds like you've seen you far share of hardship." "The life of a soldier is full of hardship. That's nothing. But they send the Legion to places that've gotten too bad to be settled without violence. What's hard is seeing good people warped by evil. And I've seen the face of evil. It was in the air above Sentinel on the Night of Green Fire." Should he be asked, he will describe what happened during the Night of Green Fire. "Back in 42 I was stationed in Hammerfell, on leave in Sentinel, trying to track down some refugee relatives who had fled persecution in Alinor. Suddenly an explosion of magic in the refugee quarter. Thalmor mages were attacking the Altmer dissidents who were resisting with magic of their own. I ran to the scene with other Legionaries who where [sic] stationed there, but the entire quarter was a smoking ruin by the time we arrived. Everyone was dead. Wholesale slaughter. The Dominion, not content with killing dissidents at home, came to Hammerfell to finish the job. We're supposedly at peace now. But I put in to be stationed here to keep an eye on the Thalmor. I've a feeling they're behind this unrest in Skyrim." You can say "Not everyone seems to want us here." to Fasendil regardless of whether you're a member of the Imperial Legion. This page was last modified on 5 November 2018, at 03:34.